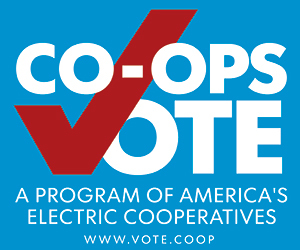 At press time for this month’s Wisconsin Energy Cooperative News, the Wisconsin Legislature was moving forward with a bill creating a sales and use tax exemption for mutual assistance services performed by electric cooperatives or telecommunications utilities during a disaster period. 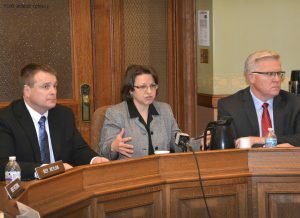 Seen here, Wisconsin Electric Cooperative Association Government Relations Director Beata Wierzba makes a point concerning Assembly Bill 583 during a January public hearing of the Assembly Committee on Energy and Utilities. Flanking Wierzba at left and right are Adams-Columbia Electric Cooperative CEO Jay Porter and Barron Electric General Manager Dallas Sloan, both of whom presented testimony describing the value of mutual aid among utilities and the effect of taxing materials previously taxed and labor provided in assisting disaster recovery. The Federated Youth Foundation (FYF)—a charitable arm of Wisconsin’s co-operatives—has issued the invitation for students to apply for the third annual Charles Van Sickle Scholarship. The $2,000 scholarship, to be awarded this spring, will go to a pre-law or law student who has an interest in pursuing a career in cooperative law. Eligibility criteria include Wisconsin residency and a minimum cumulative grade point of 3.0 on a 4.0 scale. Preference will be given to students whose parents or grandparents are members of cooperatives, credit unions, or mutual insurance companies. The scholarship is made possible by an endowment established in 2013 in memory of Wisconsin’s renowned electric cooperative attorney, the late Charles Van Sickle. Detailed information about applications and materials required can be obtained by contacting FYF Executive Director Ethan Giebel at 608-416-3318 or Ethan.Giebel@cooperativenetwork.coop. The firm application deadline is April 1. The only new U.S. nuclear generating facility currently under construction got a new lease on life at the end of last year. Georgia regulators voted unanimously to allow the expansion of Georgia Power Company’s Plant Vogtle to continue, despite cost overruns and delays. Oglethorpe Power Cooperative owns a 30 percent share in the project, which would add two new units to the two in service at the site since 1987 and 1989. The Vogtle project became the nation’s sole surviving nuclear plant under construction at the end of July, when South Carolina Electric and Gas abandoned the expansion of its V.C. Summer plant after several years’ work and expenditures of about $9 billion. In addition to Georgia Power and Oglethorpe, participants in the Vogtle project include the Municipal Electric Authority of Georgia and one local municipal utility. Regional transmission operators took special measures in January to guard against any interruption of electric service as bitter cold weather spiked natural gas demand, drove up wholesale power prices, and raised fuel supply concerns. Readers of Wisconsin Energy Cooperative News had a preview of the dilemma felt mainly in northeastern states. The magazine’s December edition analyzed the tension between organized efforts to thwart pipeline construction wherever it’s proposed, and the predictable return of the polar vortex, which triggered similar problems in the Midwest and Northeast during the winter of 2013–14. Short pipeline capacity and the resulting strain on gas supplies caused northeastern power generation to shift toward less clean-burning fuel oil. 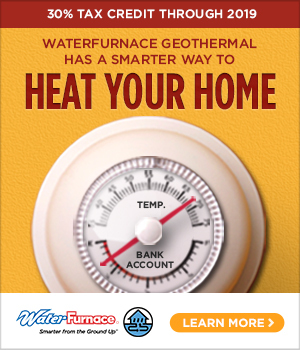 As early as December 30 the Federal Motor Carrier Safety Administration, anticipating extreme heating fuel demand, issued an emergency declaration for 37 states including Wisconsin, temporarily lifting federal limits on working hours for commercial drivers transporting propane and home heating fuels. A unanimous Federal Energy Regulatory Commission (FERC) voted 5–0 in January to reject Energy Secretary Rick Perry’s request for new wholesale power market rules designed to keep coal-fired and nuclear power plants economically viable to ensure grid stability. The so-called 24-7 “baseload” plants have struggled economically in recent years, facing competition from inexpensive natural gas as a generation fuel and the increasing market presence of intermittently available renewable generation. Perry had asked for new rules guaranteeing cost recovery for any generating facility that maintains a 90-day on-site fuel supply.